One of the qualities of our equine brethren and sisters is their ability to reach amazing speed and look majestic doing so. It was their speed first and durability second that made humans consider utilizing these fine creatures in many aspects of life, like waging war and plowing. To break the limits of wild horses in terms of top speed achievable, the breeders have made it their mission to breed, cross, and nurture the fastest horses they’ve come across. The results are the marvelous symbols of speed and power we have today. These are the fastest horse breeds in the world, in order. In one of my previous articles, I have mentioned Thoroughbreds. 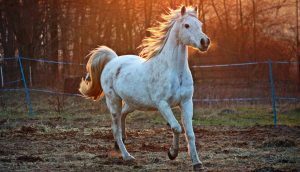 They are a breed that originated in England and developed to be the pride and joy of the British Isles, with special attention being paid to how they handle the gallop. The Thoroughbreds are bred as sprinters and stayers, depending on the distance of the race. As for the speed, it’s enough to say that a Thoroughbred made it into the Guinness Book of World Records. A filly named Winning Brew achieved a speed of 70.76 km/h or 43.97 mph. This feat is 10 years old – she did it in May 2008. In fact, most of the amazing horses that have broken records on tracks are Thoroughbreds. Here is a horse breed that is often used as a synonym and symbol of speed. Mustangs are feral horses, meaning that they are wild horses that came from the tame horses the Spaniards brought to America. They have since ridden freely across the planes. When you hear the word ‘Mustang’, your thoughts probably go straight to the car. Ford recognized the speed and power of these magnificent specimens and incorporated their name into its brand. The fastest recorded speed of a Mustang is clocked in at nearly 54 mph. Also known as the American Quarter Horse, it gets its name from the fact that it is nigh invincible on tracks that are a quarter mile or less in length. 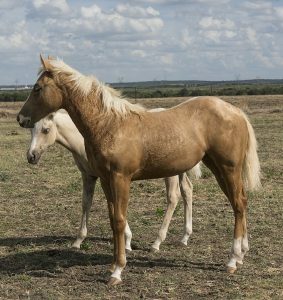 In part, the Quarter Horse has its ancestry to thank for the feats of speed – it is a cross between the Thoroughbred and horses grown by Native Americans. While not as fast as a Thoroughbred, the Quarter Horse is much more adaptable. It is often used for show-jumping, but his speed is not to be trifled with. They have been known to reach speeds over 50 mph. These beauties come from the Arabian Peninsula and are fine specimens, to say the least. They are not bred strictly for speed. As a matter of fact, it is their endurance that gives them the edge over other horse breeds. Pushed to their limits during a gallop, Arabians achieve the speed of 40 mph. However, when they are just trotting, this speed drops to measly 7 mph, which is seriously close to a human jogging. 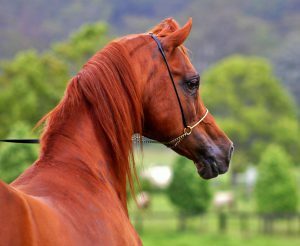 Standardbreds come from a mix of the finest horse breeds, including the Thoroughbred and the Morgan. They are slightly heavier than Thoroughbreds and have been used mostly in harness races. They are easy to train, as they like people. They are not as fast as the previous horses on the list, but that is in part due to their racing equipment. With a harness and a rider, the Standardbred achieves a speed of about 30 mph while trotting, which is, roughly, what an average unencumbered horse could do.